As the sun sets on 2008…. 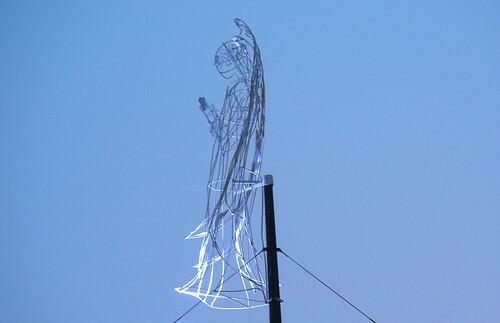 I saw this angel overlooking George Square in Glasgow…….got me thinking about angels and one of my favourite films of all time – Wim Wender’s “Wings of Desire”. If you haven’t seen it, you might have seen the US re-make which was called “City of Angels”. What I love about this movie is how it is a celebration of the wonder of being human. It tells the story of angels watching over people in Berlin (the original movie does, anyway). One of the angels longs for the opportunity to experience what human beings can experience, and he gets his wish, falls to earth and becomes human. His wonder at the range of physical sensations, his connection to others and his longing for love are portrayed wonderfully. It’s that “emerveillement” I’ve posted about recently. If you’ve never seen it, you’ve missed something. The original is in German but is readily available with English subtitles. When preparing this post, I stumbled across this fanvid on youtube, where someone has set some scenes from Wings of Desire to Nick Cave’s “Into my arms”. It works. Black Swan, author, Nassim Nicholas Taleb, was interviewed recently for Philosophy Now magazine. I happened to be reading it the other day and it came back to my mind as I sat in a train outside Queen Street station for half an hour this morning while engineers attempted to unstick a “points failure”. My core idea is about the effect of non-observables in real life. My focus is on the errors which result: how the way we should act is affected by things we can’t observe, and how we can make decisions when we don’t have all the relevant information. I really like his phrase, “non-observables”. It immediately made me think of the Little Prince, and Saint-Exupery’s theme of how what’s invisible is most important in our lives. But that’s not exactly what he means. He’s particularly interested on those events and phenomena which appear unpredictably (for example, by studying swans, you would think one of their characteristics was that they are all white. It’s only when the black one turns up in another part of the world, that you have to abandon that belief). Of particular relevance for this time of year, is his parable of the turkey. The turkey concludes, on the basis of its daily observations, that’s he’s always fed at 9am and that the people who look after him do so very well, that they care for him and want the best for him. It’s only on Christmas Eve that he discovers this was a wrong conclusion. The scientific method is based on “induction” – using particular observations to generate general laws which then allow predictions to be made. Taleb clearly points out the weakness of this approach. …..induction presupposes that nature behaves in a uniform fashion, but this belief has no defence in reason. I also like this phrase of his – “I’m interested in the ecology of uncertainty, not induction and deduction”. The ecology of uncertainty is such a great phrase. How often do we desperately seek certainty in order to make our lives predictable? But it’s a delusion. The world is full of uncertainty. In fact, the more complex the issue, the less certainty we can find. Human beings are complex adaptive systems. We aren’t able to predict, in individual cases, exactly what course a disease will take, nor, whether or not a particular treatment will work. I’m grateful to Nassim Nicholas Taleb for his work on uncertainty. As science begins to grapple with complexity, scientists are going to have to learn how to handle “the ecology of uncertainty” instead of relying on induction. Does depression make for better doctors? Does such a training make for better doctors? I doubt it. Such an experience is something to be survived and whilst I’m well aware that difficulties and even illnesses can teach us a lot about ourselves and even contribute to our growth, I wouldn’t recommend dysfunction and disease as the best teaching methods! These experiences are more likely because we pay insufficient attention to the humanity of the real people who are health carers (the parallel to paying insufficient attention to the humanity of the real people who are patients). We practice a system of medicine which is focused on tools and techniques, not least on drugs, because our clinical focus is disease (lesions, pathology), not health. The rise of something called “Evidence Based Medicine” has made this worse. “EBM” is based on the statistical analyses of experimental “controlled” trials. The design of these trials is intended to “control for” the human factors in order to reveal the specific treatment factors ie the effects of the prescription, not the prescriber. It is virtually impossible to read in any significant clinical trial who the actual carers were. It’s as if they don’t count. They are irrelevant. But they aren’t. And until we change our values in health care and give a higher priority to the fact that health care is delivered by real people to real people then we aren’t going to change the outcomes. Is it impossible to imagine a medical training which doesn’t cause depression in a third of the people who embark upon it? The day I went unicorn hunting…. 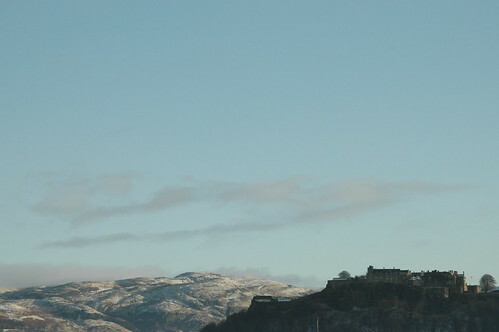 Stirling, Scotland, where I was born is dominated by a beautiful Castle. I saw a news item on the BBC recently which announced the hanging, in the Chapel Royal within the Castle, of the latest tapestry in the series “The Hunting of the Unicorn”, so I decided to go and see the unicorn for myself. 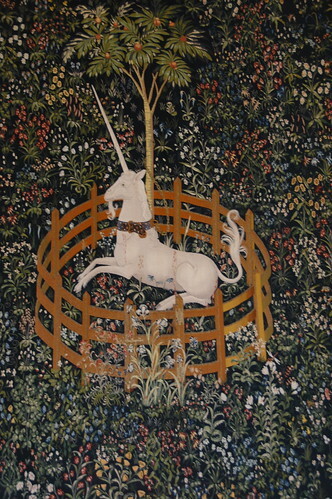 As part of a project to restore the Palace in the Castle, Historic Scotland has commissioned the weaving of a series of tapestries depicting a unicorn. 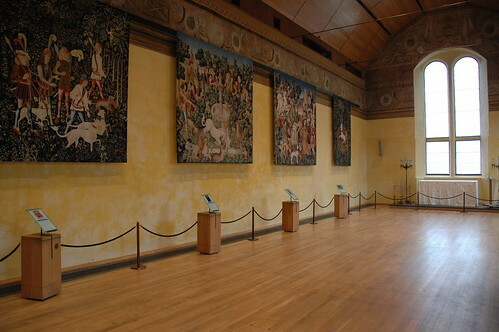 James VI and I’s mother, Mary Queen of Scots, and her mother Marie of Guise were known to have such tapestries hanging in the Palace but the originals have long since disappeared. To give visitors an impression of life in the Castle in the 16th and 17th centuries, a team of weavers are making copies of a famous set of unicorn tapestries from that period. The original medieval set, known as “The Hunting of the Unicorn”, can be seen in the Cloisters in New York. 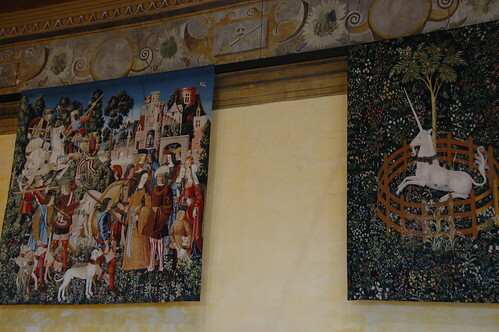 The new tapestries are hung in the Chapel Royal for now, while the Palace is restored (all the tapestries should be complete by the time the Palace refurbishment in complete in 2011). Unicorns are very familiar creatures to Scots. King Robert III was the first to use the unicorn in the Royal insignia, and the Stuart kings developed the motif further using both rampant unicorns on heraldic emblems and producing silver coins with the unicorn stamped on them. It was James VI and I who brought together the Scottish unicorn and the English lion when he became king of both countries. So it’s not hard to find unicorns in Scotland. 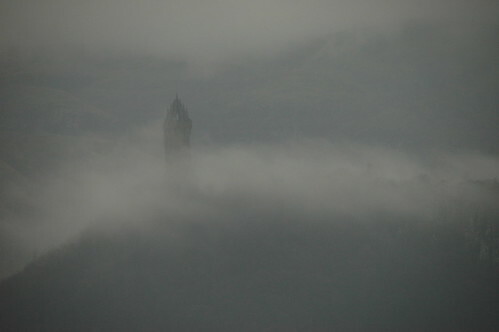 They’re on flags, stone carvings, painted insignia, they stand proud on the tops of buildings and adorn many monuments. Let me tell you a little of what I’ve discovered about the mythology and the symbolism of the unicorn, and, in particular, of the unicorn stories represented in the tapestries. The unicorn was believed to be so wild that it could not be hunted and captured, except by using a maiden, or virgin. To capture a unicorn you’d bring a maiden into the forest and the unicorn would come and lay its head on her lap and fall asleep. Only then could you capture it. “The Hunting of the Unicorn” series depicts the unicorn like a stag being hunted, but strangely ends with the last one I’ve photographed above where the unicorn is alive, its wounds seemingly not to have harmed it, enclosed in a garden and chained by a golden chain to a pomegranate tree. There are two common readings of this story. The first claims that the story represents the Passion of Christ from his birth to his cruxifixion, and the second claims that the unicorn is the lover, the hunters are love and the maiden is the beloved. In this latter interpretation, the lover is wounded by love (but the wounds, like Cupid’s arrows, don’t kill), and is captured by his beloved to whom he is then married (the symbol of the pomegranate tree). This second interpretation is, I think, especially interesting. It tells us about the wild, free, passionate one, becoming captured and tamed by (bound to) the maiden (who as the Virgin, or Madonna, represents unconditional love). If you take these interpretations of the tapestries, then look at another unicorn tapestry series which is in the Musee de Cluny in Paris – “La Dame a la Licorne” – which depicts the maiden with a unicorn in six tapestries, one each representing a sense, taste, sight, touch, smell, hearing and the sixth entitled “A Mon Seul Desir” (where the maiden places her necklace in a casket), I think the overall effect is really very interesting. Could these tapestries be telling us something about psychology? You could easily see the unicorn as wild passion, especially when placed next to each of the five senses. In fact, if you look at the panel “Touch” in the Cluny series, it’s not difficult to see the unicorn’s horn from a Freudian perspective! Does the unicorn represent the libidinous ID? And is the Virgin, the source and symbol of unconditional love, the Superego? If so, and if we accept Saint-Exupery’s use of the term “taming” in his “Little Prince” which is about forming a bond, then the final panel in “The Hunt” really shows us the potential of a healthy, realistic ego – the union of the passions with love. OK, so that last paragraph is what woke me up at 5am this morning, and I’m not entirely sure what I think about it yet, but there is it is. I thought I’d share it with you. If these wonderful works of art and craft teach us that our goal should be to live a life of passion and unconditional love then I’d recommend we all go unicorn hunting! The focus of medical practice is the lesion. It’s the lesion, the abnormal cells, tissue, organ or body system which IS the disease. This is the pathological approach to health. It gives pre-eminence to physical, “organic” abnormalities, names them (diagnosis) and then seeks to directly address those abnormalities with treatments. The treatments are primarily surgery to physically remove the lesions, and chemicals (drugs) to act against the lesions (or, in the case of infections, to act against the infecting organisms). This approach works well for most acute disease and for clearly identifiable lesional problems. In fact, the more localised the problem, the greater the success of this way of working. However, there are at least two major difficulties. Firstly, the more complex a disorder, the harder it is to identify a “lesion” which is the sole cause of the patient’s illness. Secondly, there’s the difference between objective findings and subjective experience. Studies of symptoms have shown clearly that there is no direct linear relationship between lesions and symptoms. Not everyone with the “same” lesion (same diagnosis at same stage of disease) has the same symptoms or the same symptom severity. And, a person can have debilitating or incapacitating symptoms without lesions. Here’s a study which highlights the other side of this coin – people can have lesions without symptoms. In this study, people with abnormalities in their MRI scans typical of Multiple Sclerosis but without any symptoms of MS – in other words where the findings were by chance while investigating some other problem – were followed up. 30% of them had developed symptoms of MS within about 5 years, but another 30% showed more lesions on the scan within 5 years but still no symptoms of MS. The researchers ask the question – does someone have MS if they have MRI-revealed lesions but no symptoms whatsoever? They argue a definite NO. Read that conclusion carefully. They are arguing that we should address people not lesions. If we fully take that on board, there are significant consequences for the way we provide health care.